The complete script of a powerful and moving play. “AN INSPIRED CHOICE” Mister Lowry at the Bristol Old Vic. "The world premiere of John Caine’s incisive portrait of the painter L.S.Lowry proved an inspired choice at the Bristol Old Vic. The play says as much about the trials, traumas and quiet triumphs of the North Country artist as any full-blown biography. "Lowry’s relationship with his parents – a stiff and starchy father who did not encourage him but plainly was as proud as Punch of his work, and a talented but invalid mother who Lowry adored – is a strong thread throughout, with his mother standing as substitute for the only love of Lowry’s life, a fellow student at art school. "But the darker side of Lowry’s complex character is also given full rein – his contempt for the critics who for most of his life considered him to be a ‘Sunday painter’ his hatred for the view that he could only paint ‘matchstick men’ his periods of depression at his loneliness, and his suppressed sexuality." 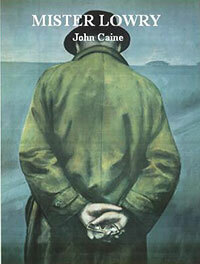 “The world premiere of John Caine’s incisive portrait of the painter L.S. Lowry proved an inspired choice at the Bristol Old Vic. The play says as much about the trials, traumas and quiet triumphs of the North Country artist as any full-blown biography. “Lowry’s relationship with his parents – a stiff and starchy father who did not encourage him but plainly was as proud as Punch of his work, and a talented but invalid mother who Lowry adored – is a strong thread throughout, with his mother standing as substitute for the only love of Lowry’s life, a fellow student at art school. Raymond and Antonia are like any couple in their 60s. They have their flaws, their ups and downs, but after 30 years they still love each other. Now they face a choice – the hardest choice of their lives. Diagnosed with an incurable and relentlessly progressive degenerative disease, Raymond has decided that he wants out before the illness takes over. However if he is to end it, he needs the help of Antonia. Raymond, an atheist, has no ethical concerns about killing himself, nor does he believe that anyone else has the right to interfere in his decision but, as a lawyer, he does realise the potential legal implications for Antonia if she assists in his suicide. For Antonia, a practising Catholic, the criminal consequences that might result from helping Raymond to die are of less concern than the religious and moral issues. As the couple struggle towards a resolution of what both of them, from their different viewpoints, consider to be the crucial questions, they gradually reveal more of the thoughts and emotions that they have kept hidden, during the twenty-five years of their marriage.